Hop extract provides a simple way to increase the bitterness of your beers. 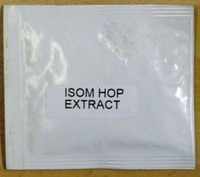 Isomerised Hop extract provides a easy way to increase the bitterness of your beers. Simply add as much of the sachet as required to your finished brew either at the start of fermentation or at the bottling/barrelling stage. This product is available both as a liquid or a powder depending on which supplier we get it from. Both work exactly the same way and you will be sent whichever variety we have in stock.